THE FIELD OF SWORDS tell the powerful, dramatic story of the friendship and enmity between the two men who ruled the Roman world. As he takes the legions north into mighty battles with the Gallic tribes, the imperious stand of Caesar and the leadership of his men, his new friendships with fellow leaders and his overwhelming ambition, begin to separate him from Brutus, the great swordsman and warrior. Their long friendship reveals ominous cracks under the strain. Although the Gallic conquests lead to Caesar's triumphal entry into Britain, the victories on the battlefield cause political rivalries at home, and ultimately the famous choice is presented to Caesar and Marcus Brutus. They must choose whether to cross the Rubicon - together or singly - and to take the fight to Rome itself. 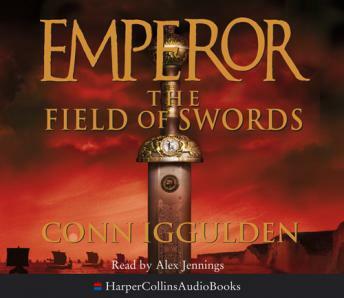 Conn Iggulden is a brilliant storyteller. Characters jostle for space in the crowded streets, on the battlefields and in the corridors of the Senate. The friendship and rivalry between Caesar and Brutus provides compelling reading. Each book in the EMPEROR series causes readers to return to the previous novel, and ensures they also look forward hugely to the next.